Escape to the Zoo with a Team-Building Retreat! Team-building retreats at the St. Augustine Alligator Farm Zoological Park provide a one-of-a-kind day of invigorating, trust-building activities your staff will never forget! Indoor and outdoor meeting facilities for presentations and workshops. Fun and focused activities to help your group build bonds. A beautiful setting for an unforgettable day out of the office. *Cocktail events offered at conclusion of activities only. No alcohol consumption is permitted prior to Crocodile Crossing, Python Challenge, or physical team-building activities. 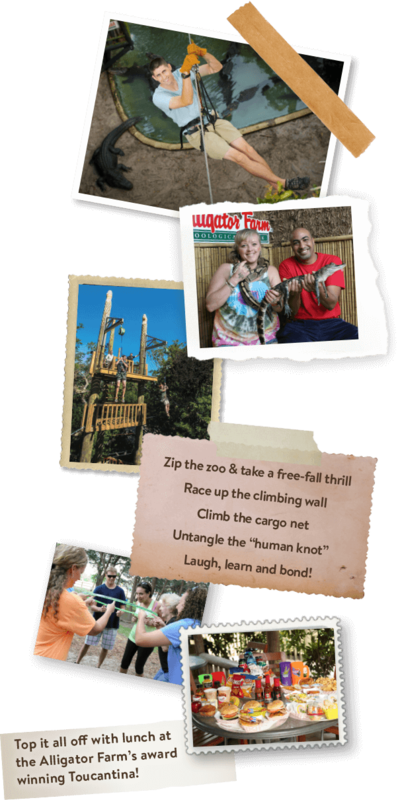 The Alligator Farm’s unforgettable team-building retreats—which can include a climbing wall, Crocodile Crossing Zip Line Adventure, Python Challenge free-fall-jump, and a wide range of strategic games and challenges—provide a fun, interactive experience that helps your team create bonds and build trust. Top it all off with lunch at the Alligator Farm’s award-winning Toucantina! All activities are “challenge by choice” to ensure safe, comfortable participation for all ages and fitness levels. It’s a perfect day out for any size or type of business or organizational team! Sepik River Course for up to 20 people with the Tower (rock climbing wall) & Zoo admission included. Sepik River Course for 21-40 people with the Tower (rock climbing wall) & Zoo admission included. Nile River Course for up to 20 people with the Tower (rock climbing wall) & Zoo admission included. Nile River Course for 21-40 people with the Tower (rock climbing wall) & Zoo admission included. Call or email the Alligator Farm today: zoosales@alligatorfarm.com or (904) 824-3337. We’ll help you plan an exciting retreat that will get the staff’s heart pumping and rev up the energy and focus of your business or organization. WATCH HERE TO LEARN MORE!